Despite the conglomeration of super-heroines in the Marvel Universe, standing at the center of it all for over fifty years is the distaff member of the Fantastic Four, Susan Richards. 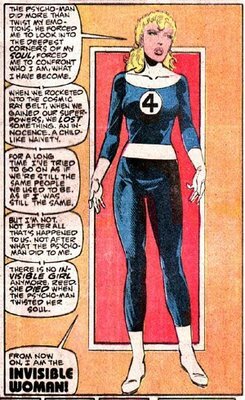 Although by-passed in popularity over the years by various X-Women, Spider-females, and assorted mercenaries and secret agents, her fictional biography is as rich as any in the comics medium, and due to the era in which she was created, and the sheer length of publication of the Fantastic Four, her character would experience all the peaks and valleys of the treatment of female heroes, from the burgeoning Women’s Rights movement of the 60s & 70s, through to the “Image-ization” bad-girl era of the 90s.With all that, for the most part, her depiction by various and sundry hands would remain true to the Stan Lee/Jack Kirby core of family and friendship. Let’s begin at the beginning. Stan Lee has said in interviews that it was important to have a female member of his new Fantastic Four comic, and that she be more than just a damsel-in-distress, but would instead be an integral, functioning member of the team. Unfortunately, despite his good intentions, Sue Storm would be saddled with breathy, romance comics dialogue, and second-tier status for quite a while. 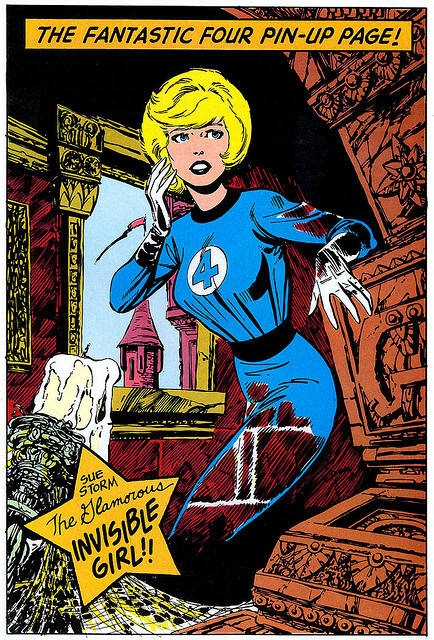 As comics historian Trina Robbins points out, in her excellent book The Great Women Super-Heroes: “Sue Storm’s power and flaws were almost a caricature of Victorian notions of the feminine, an invisible woman who faints when she tries to exert herself”. As early as issue #11’s “A Day With the Fantastic Four”, the group receives a “fan” letter (within the series, there was an FF-authorized Marvel “Fantastic Four” comic!) griping about Sue’s role with the team, which probably reflected some of the real mail they were getting! Stan and Jack may have realized this too, so things would begin to change, albeit slowly. By issue #22 Sue would gain the force-field power she’s now most known for, and a romantic triangle with Prince Namor would mostly disappear. Reed Richards would come to realize how important Sue was to him, and “pop the question” in Fantastic Four #35, with the first super-hero marriage following in Fantastic Four Annual #3 (on the last panel of which, Stan and Jack are thrown out as wedding crashers by Nick Fury! ), and the birth of Franklin Benjamin Richards in Annual #6. Admittedly, these are events that could have come from the pages of “Our Romance”, but compared to the early 1960s’ versions of Lois Lane, Lana Lang, and Vicky Vale, who spent their time trying to uncover the boy’s secret identities or force the heroes into relationships, Susan Storm might as well have been Gloria Steinem.In the 1970s, under writers Roy Thomas and Gerry Conway, Sue would begin to experience some small measure of personal growth, including her rather reasonable demand of Reed to be treated as something other than “The mother of your child” in issue #130, which would lead to the Richards’ separation for nearly two years. Things changed for the better in a dramatic way once writer/artist John Byrne took over the book with issue #232 (“Back to the Basics”) in 1981. His vision of the Invisible Girl was that of an equal member of the team, and as Dr. Doom himself pointed out on more than one occasion, the heart of the group. Under Mr. Byrne’s stewardship, Sue’s powers and abilities would increase, and she would begin to use her force-fields for offense, as well as defense. More importantly, she would become a mature, fully-formed woman, able to withstand trauma (see issue #267!!) that would have laid low previous versions of the character. A momentous change would occur in Fantastic Four #280-284, as Susan Richards, after being transformed by the Psycho-Man into Malice, an avatar of her own dark nature, fights off his control, turns his fear weapons against him (off-panel, followed by the chilling line “Psycho-Man is no longer a threat”–you go, girl! ), and declares, at the finale of a great swatch of dialogue, that she is no longer a “girl”, but the Invisible Woman. When Mr. Byrne left after 5-plus years, the book and characters were mostly in a holding pattern (excepting the quite enjoyable Walt Simonson run), although that equilibrium was preferable to the horrors that were to come in the 1990s. The creative team of writer Tom DeFalco and artist Paul Ryan logged 58 consecutive issues starting in 1991 — some good, some not-so-good–but with both gentlemen having produced fine work elsewhere, what would follow must have come from “higher-ups”. Now, I can’t speak to the corporate politics of the time, but with the “Image revolution” going full-bore, and Marvel looking to re-capture some of their lost momentum by being “edgy” (uck! ), we would have to endure the sight of wife and mother Susan Richards, togged-out as if she belonged on the cover of a fetish magazine, with thigh boots, leg straps and a midriff-baring top– oy, gevalt! (The Fantastic Four would get the complete “Image Treatment” during the “Heroes Reborn” debacle of 1996, with Jim Lee providing the cheesecake!) After a year or so of much grousing from fans both male and female, they abandoned this travesty, explaining it away as a manifestation of the “Malice” side of Sue’s personality. Interestingly, the stories that followed were better—in the wake of Reed’s “death” in #381, Sue would come to lead the team, and do so quite well, and when Reed returned, they would become co-leaders; the “Mom & Dad” of this family, if you will. In the intervening years, despite some good work by Mark Waid on the Invisible Woman (on the others, too, although not so much on Dr. Doom), things were becoming rather stale. After many years of “drift”, Jonathan Hickman, in his recent, long-running turn on the book, has thankfully re-captured the inner core of these characters, with Sue being the biggest beneficiary of a make-over. She is once again a capable, strong, woman; self-aware enough to allow her emotion to rule the day when need be, yet not so much as to allow it to become a weakness, but always leavened with intelligence and compassion. Susan Richards, daughter of Mary & Franklin Storm, is once again the heart of the Fantastic Four, restoring the balance of personalities that Stan Lee envisioned all those years ago. To use a musical analogy, I was privileged to have a conversation some years ago with Levi Stubbs, the lead singer of the Four Tops, who explained to me that his group, which had stayed together un-changed for over 40 years, had come to think of themselves as “four voices, four people, that make up one whole person”. The Fantastic Four is at it’s best when that aspect of the book is ascendant; when all the members of the Richards’ blended clan are in harmony, with all being equal parts of the whole. In real life, a family is only as strong as it’s parents, and for many of us who grew up with this title, the Fantastic Four have been our comic book “family” with Sue and Reed at the head of the table, and as such, we celebrate when they’re happy, and weep a little inside during tragedy. For all that time, we always knew that in a tough spot, our “Mom” would make things right.